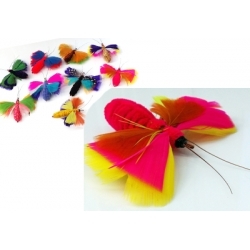 Attaches to the end of the wands imitating a colourful Butterfly/Moth. Made of CHENILLE fabric from shorn Sheep wool/Yarn, the chenille yarn is manufactured by placing short lengths of yarn, called the "pile", between two "core yarns" and then twisting the yarn together. Plus feather stems for legs & real feather Wings. Excellent realistic size approximately 5cm long x 2cm high in body plus various colours and size turkey /pheasant feather wings. PLEASE NOTE - The legs and Wings are made from natural real feathers so are a more delicate part of the toy for decoration purpose. The body is solid and very durable to take a beating!